Editor’s note: Give Kids The World Village is always filled with the sounds of laughter and fun. But now the Village is filled with a different sound: ukulele music. In today’s guest blog, GKTW Brand Engagement Manager Emily Wagner shares her experience with our newest partner, the Ukulele Kids Club. When I came to work at Give Kids The World Village, I knew I’d love spending time with the families and volunteers and sharing their stories. What I didn’t know was that the music made at this tiny Village would be one of my favorite things about the job. Some of the music appreciation came instantly. Where else can you hear Christmas music being played every Thursday besides my own car? And then I heard the music that our talented guests create – from a three-year-old bravely singing aloud for the first time during Village Idol, to an elementary school band playing Disney songs to brighten the days of critically ill kids their same age. After a little more time, I picked up on the melodies of the Village itself; the sounds of the Enchanted Carousel turning, the trickling of the fountains and Splash Pad, the sound of kiddos laughing as they ran down the Avenue. This place is full of music and magic, and recently, it’s become even fuller thanks to our special friends from The Ukulele Kids Club. This music therapy non-profit organization has spent years harnessing the healing power of music and teaching hospitalized children how to play the ukulele. What’s more, they’ve given more than 5,000 ukuleles to these kids so that they can continue to enjoy the gift of music. Last month, The Ukulele Kids Club started visiting the Village for a weekly ukulele lesson open to all families. 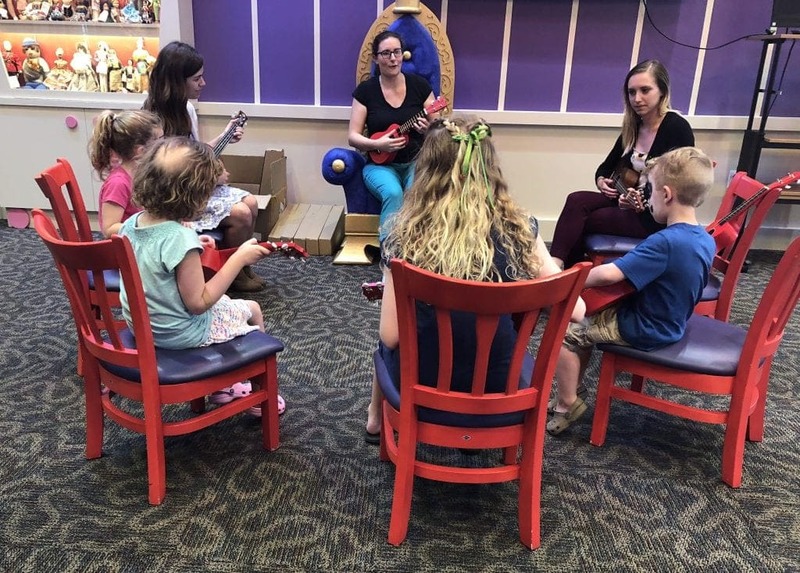 Music Therapist Katie comes every Tuesday evening, sets up and tunes the ukuleles before inviting kids to come learn to play. Katie covers how to hold the ukulele, what colored string combinations create chords, and how to strum the strings rhythmically. Before too long, the kids are surprised to find themselves playing popular tunes including “Row Row Row Your Boat” and “Twinkle Twinkle Little Star,” as well as music from beloved animated films and Top 40 artists. Recently, I was lucky enough to join Katie and the kids for The Ukulele Kids Club. This is something I’ve eagerly awaited since its announcement. I started playing ukulele myself a few years ago as a solution for sad days and a small apartment that couldn’t hold a piano, and I quickly fell in love with the cheerful, simple sounds. It’s a graceful little instrument that sounds pleasant even when you mistake a chord or two. But after playing with the kids last night, the ukulele is a whole lot more. It’s independence to children who can’t always do things on their own due to health concerns. It’s ownership and pride for siblings who share toys and schedules around hospital stays and doctor visits. It’s confidence for a little one who was shy in front of the Disney Princesses, but suddenly has no fear belting out their signature songs. And, especially at Give Kids The World, it’s one of the most joyful sounds I’ve heard. Emily Wagner is the Brand Engagement Manager at Give Kids The World. She loves that her role is full of creativity, connecting, hashtags, puns, and sharing the stories of the Village. When she’s not working, Emily loves to travel, dance, and rearrange Star Wars-inspired lyrics to songs on her ukulele.